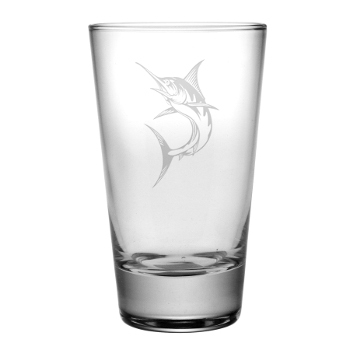 Hiballs, 15.5oz., Marlin, Etched Glass Set perfect for any beverage when entertaining at your coastal home. Impress your guest with this designer set of Marlin drink ware. Hand decorated by skilled artisans at Susquehanna Glass in the Amish Homelands of South Central Pennsylvania. Built upon pride in craftsmanship and quality,this family owned business has been productive in America for one hundred years. This Marlin designed glassware is perfect elegance and will charm your guest at your coastal entertaining occasion.